This was OUR Super Bowl. 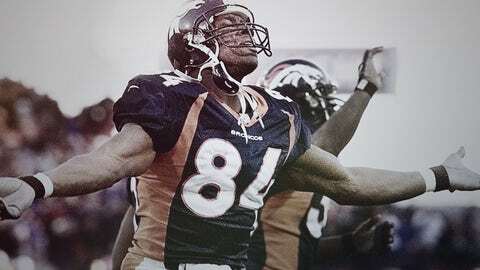 Ten minutes earlier, my Denver Broncos beat the Green Bay Packers in Super Bowl XXXII in San Diego. I was about to be interviewed by my brother Sterling, and I could barely hear him over the noise inside Qualcomm Stadium. As confetti rained down on my head, I kept repeating the words I’d wanted to say to him for a very long time. Sterling should have won his own Super Bowl. In my Hall of Fame speech, I said I was the only pro who’s reached Canton that was the second best player in my own family. If fate had been kinder, Sterling would have had a bust there long before me. 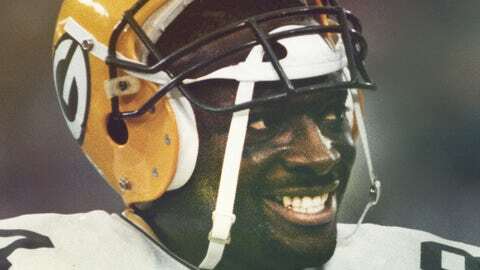 A career-ending neck injury forced my brother to retire after seven seasons with the Green Bay Packers, five in which he was named to the Pro Bowl. That injury denied my brother the full NFL career he earned. There was nothing I could do to give that to him. But there was one thing I could do. One thing I could win. One thing I could give. Saturday felt like it was never going to end. I was in my hotel room the day before Super Bowl XXXII willing the clock to go faster. It refused. 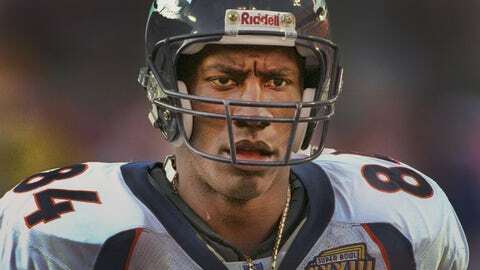 I wasn’t nervous to play in my first Super Bowl. I wasn’t nervous to face the Packers. I wasn’t nervous about winning, and I didn’t even consider losing. As the seconds continued to tick away, all I could think about was making it to the stadium and getting on the field. When Sunday finally came, I refused to wait around. I got to the stadium six hours early. Being in the locker room put me at ease. I tried to stay in my normal routine as best I could. The staff had laid out everything I needed for pregame. Three packs of Big Red gum. And a pair of linemen socks. I returned those socks to the equipment manager every week and exchanged them for a pair of running back socks before the game. Maybe it was an odd routine, but three Super Bowls and a Hall of Fame induction later, it feels like the process probably worked. When I took the field that night, the stadium was already over half full. Cameras surrounded me. Despite my best efforts to reassure myself this was just another game, I knew it wasn’t. There’s no other game like the Super Bowl. I remember very little from the actual warm up. Before kickoff, Broncos coach Mike Shanahan gathered us around and simply said “Let’s go show the world what we’re about.” We prayed the ‘Our Father’ and then it was time. Like the hours before, the game itself felt longer than normal. Neither team was able to keep momentum for long stretches, and we went into the final two minutes up by only a touchdown. Against another team, I may have breathed easy up one score with two minutes to play. But we were playing Brett Favre. He completed his first pass of the drive for 22-yards. Like that, the Packers were on our half of the field. As the seconds continued to tick down, Favre got Green Bay inside the 35-yard line. He threw incompletions on second and third down, leaving him one more attempt with 32 seconds to play. On our sideline I saw defensive coordinator Greg Robinson give the signal for a bomb blitz. He was sending everybody on fourth down. I watched Favre drop back, feel the pressure, and release. That ball hung in the air for what seemed an eternity. I watched it hit the dirt and all at once, I was totally overcome. You sacrifice so much to get to the NFL. You miss recitals and graduations. Moments that you can’t have because you’re focused on being the best. It’s all for that final moment, when you’ve finally realized what all of that work and sacrifice was about. I had been very selfish on my path to that championship. My place in the game was made that day. No one can take away that championship. As I hoisted the Lombardi Trophy I knew the time had come to give back. I won three Super Bowls in my career, but the first was the most special. It wasn’t my victory alone. It was Sterling’s as well. So I gave him my ring. Sterling still has it, and wears it. Super Bowl XXXII was a victory made long before stepping on that field in San Diego in 1998. It was earned with my brother guiding me as a kid in Glennville, Ga., and as a seventh-round pick out of Savannah State. Even at the pinnacle, that ring was always his.